Note from Your Host, The Truth Hound: The vitally important report below comes from vote-scam investigator Jim Condit Jr. of Ohio. He has considerable expertise when it comes to electronic election fraud. This article supplements another article now posted on this website about the Truth Hound’s recent direct delivery of news and information on election fraud to the Trump campaign at an Aug. 23 large rally in Austin, Texas. One of the traits of these “Election Count” gatekeepers is that they periodically change names, and/or buy each other out, but the players and background forces remain essentially the same. These surface changes of ownership and of names seems designed to give the impression that the gatekeepers are diverse as opposed to comprising a monolithic force, and perhaps to try and keep ahead of the investigations and criminal indictments that should have come long ago. For most of the last two decades, four mega-companies “counted” around 96% of the USA vote on election nights. These companies were ES & S (Election Systems & Software), Hart InterCivic, Diebold, and Sequoia. Veteran reporter Ronnie Dugger covered this reality in his 2004 article in The Nation magazine entitled, “How they could Steal the Election This Time”. Circa 2013, a company called Dominion bought Diebold and Sequoia. So that’s why we have 13 crossed out, and now we have only 12 Election Night gatekeepers; and 4 crossed out, so now we have only 3 mega-companies counting 96% of the American vote. One of these three companies, ES & S, headquartered in Omaha, Nebraska, “counts” 60% of the US vote on November election nights. A word about the musical chairs played by these super powerful mega-corporations, which never change their stripes, their secrecy, or their mode of operation: as an example, CES (Computer Election Services) was based in California in the 70s and early 80s. Then CES morphed into BRC (Business Records Corporation) based in Texas for the 80s and part of the 90s. BRC then became ES & S as the new century began. Another example of musical chairs involves Voter News Service, which will be explained below. PLEASE NOTE: These 3 mega-corporations do NOT break into the system. These companies are hired by each county. There are 3200+ counties in the USA. And 99% of these counties make the decision to hire one of these companies. For instance, Hamilton County (Cincinnati), Ohio uses Hart machines. Butler County, Ohio (the largest county in former Speaker of the House John Boehner’s former district) hires ES & S. And all of South Carolina (where there are no paper ballots used at all) hires ES & S.
The RNC and the DNC are obviously controlled by the same background financial forces which own the billion dollar companies, ES &S, Hart, and Dominion. The RNC and the DNC both recommend to all of their 50 Secretaries of State in all 50 states to approve these three mega-companies for vote processing. The counties in each state then are strongly encouraged to hire these three companies, to contract with them to process the county elections. The county Boards of Elections are told that any one of these three companies will process the elections professionally and virtually trouble-free. The local Board of Election officials in each county then step aside and hand everything essential over to one of these three companies. After the November election night, “results” are posted when the election officials have no idea if the results are true or false. Through this collusive apparatus, all announcements are made to the public by the Big TV Networks and AP after they get the word from NEP, their jointly owned private company. All big-media websites on the national and gubernatorial election announcements are controlled by NEP. When NEP changes something, it changes on all websites. IMPORTANT: ANY COMPETITION between the 5 Big TV networks on projecting winners and losers is a total fake and a deliberate deception on the part of the 5 Big TV Networks. 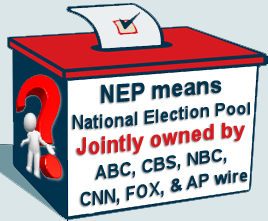 The Five Big TV Networks get the exact same information, at the exact same time, from the exact same source, i.e., the company they jointly own with AP, i.e., NEP (National Election Pool). So-called Exit Polls and Entrance Polls (at the Iowa Caucus) are done by NEP, and then the results are passed on to five owners of its six owners, the 5 Big TV Networks, simultaneously. And yet the Big TV Networks have maintained this “we’re projecting the winner first” deception since the dawn of the computerized election age, circa 1973. 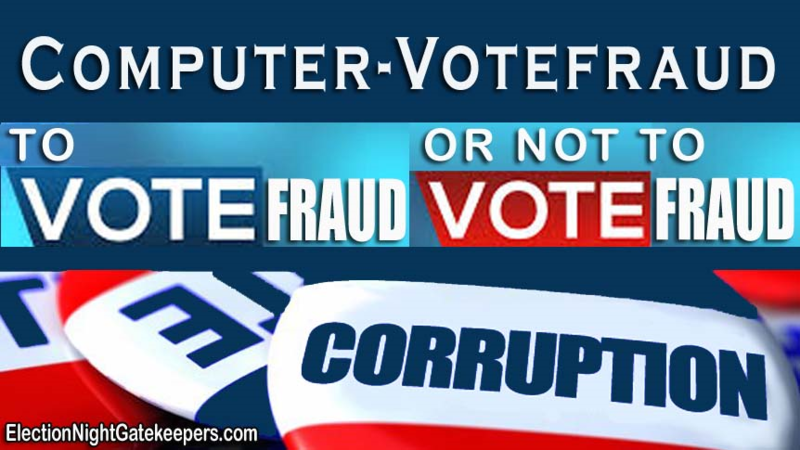 The purpose of the highly questionable VNS/NEP/ABC/CBS/NBC/CNN/FOX exit polls (debunked completely, in my opinion, in two chapters in “Votescam: The Stealing of America” by the late Collier Brothers) is to prepare the TV viewer for the unverifiable computer “count” which is announced a few hours, or even a few minutes later in the evening. We caught up with just two exit polls over the years — since they are very, very hard to find. Why? Because there are very few of them and the networks do not give notice where they’re located. Can such few exit polls, in a nation of 200,000 or so precincts, provide any kind of a scientific basis to project winners and losers in Congressional, Senatorial, and Presidential races? One exit poll we caught up with was being conducted during the New Hampshire Presidential Primary on February 20, 1996 at a school in Manchester. The lady hired by VNS (Voter News Service, predecessor of today’s NEP) told us that they arrive about 9 AM, missing the morning rush from 7 AM to 9 AM. Then, only about one out of 15 people will talk to them. Why? Some people don’t want to talk about their vote. And many people are in a hurry. They have to be somewhere, pick up their mother for a doctor’s appointment, have to get to work, etc. Furthermore, the VNS exit pollsters call in their results to VNS in New York City at about 5 PM — meaning that they miss the evening rush hour from 5 PM to 7 PM. We filmed the VNS lady calling in her results on a pay phone in the school lobby while HUNDREDS of people were walking past her on their way to vote in the school gym. Missing the morning rush? Missing the evening rush? Only 1 out of 15 people willing to talk to them? Where is the scientific basis of these exit polls? By the way, here is a picture of the Voter News Service box in which the NH exit poll lady placed her filled-out exit polling forms, in case there is any doubt about who owned Voter News Service then. Click here for the picture of that box. And the owners of the successor to VNS , the NEP (News Election Pool), are revealed on Wikipedia, among other places. Click here for the owners of National Election Pool. In the 1992 New Hampshire Primary, the exit polls showed Buchanan in a dead heat with President H.W. Bush the elder. But the evening started with a 49% to 49% tie between Bush-Buchanan. Then Buchanan “dropped” every three hours by 3% while Bush stayed at 49% (virtually a statistical impossibility) throughout. By morning, the published “results” were 49% for Bush and 37% for Buchanan. This was clear manipulation by the crooks running the New Hampshire election system both in the computerized half of NH and in the hand-counted half (at that time, now it’s 80% computerized, 20% hand-counted) to save face for then-President Bush the elder. When Warren Mitofsky of (then) Voter News Service was asked how come his exit polls were so far off, he replied in Time magazine (paraphrase), “Because the Buchanan supporters were so much more willing to talk to us.” WELL THEN, Mr. Mitofsky — where is the scientific basis for your exit polls? The second exit poll we caught up with was in Boone County, Kentucky in 1996 on the day of the November Presidential election. Someone called my office about 3 PM in the afternoon and I rushed over to the location as fast as I could after finishing up what I had to do. With rush hour traffic, I got their about 5:20 PM with a 7:30 PM poll closing. True to what the VNS exit poll lady in New Hampshire had told us, the exit pollsters had already left. Again, there were HUNDREDS of people in line waiting to vote. How does missing the rush hour periods of the election day — with only 1 out of 15 voters willing to talk to the exit pollsters in the intervening hours of 9 AM to 5 PM — provide any kind of a scientific basis to project winners and losers, especially in close races? Which brings us to one of the most absurd “projections” in the computerized election era: the 5 TV networks “projecting” Al Gore to “win” Florida at about 9:45 PM on November election night in year 2000, during the infamous Bush-Gore contest. It turned out that there were only 39 exit polls being conducted by the Voter News Service for their owners, the 5 Big TV Networks, throughout all of Florida that election night. That’s 39 exit polls in a state of 7000 voting precincts! Now keep in mind that the election was allegedly so close it wasn’t decided (?) until 35 days after election day. And yet, on the basis of these 39 magic exit polls, all the 5 Big TV Networks projected Gore as the winner in Florida about 10 PM EST, which would have give the election to Gore. A little later, “W.” Bush came on TV in one of the Bush homes in Texas to state that (paraphrase), “My brother said that wasn’t right.” Now what W’s brother, Governor Jeb Bush of Florida, had to do with the election count is still unclear. And at about 2 AM EST, all the Networks reversed themselves and said it was too close to call. Again, how could 39 exit polls out of 7000 voting precincts project a winner or loser in such a hairline-close election? Some mind games were being played on the American people, but that’s another story for another time. And the story of Senator Bob Smith’s re-election in New Hampshire in 1996, in a way, says it all. Smith talked about how all the TV networks called him the loser in 1996 in the New Hampshire Senate race — only to be proven wrong when the hand-counted ballots came in. “They forgot that in New Hampshire we count the votes before we declare the winner,” Smith told a C-Span interviewer with a smile. That’s right. In 1996 there were 33 races for US Senate in 33 states. At that time, FOX News was only a few months old, so they were not yet involved as an owner of VNS (Voter News Service). But based on VNS exit polls, the other four networks, — ABC, CBS, NBC and CNN — “projected” the correct winner in 32 of the 33 states, i.e., in the states that were “counted” on the secret, easily-rigged computerized elections. In the 33rd state, in New Hampshire, in the one state where 1/2 of the votes (at that time in 1996) were counted by hand immediately as the polls closed, ALL FOUR NETWORKS GOT IT WRONG. All four networks projected the Democrat, Richard Swett, as the “winner.” But as the votes trickled in from the hand-counted sections of the state, the Pro-Constitution Senator Smith pulled ahead and WON the race. Smith said is was like going to Hell and then told you were really going to Heaven. What obvious lessons should one draw from this Bob Smith-New Hampshire 1996 episode? 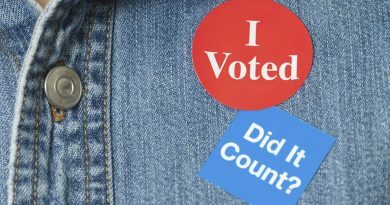 — b) That when the state was “counted” 100% by the secret, easily-rigged computer programs, then the computerized election process could always make the projections “come true.” BUT when one of the states was counted partly by immediate hand-counts at the neighborhood precincts, all the Big TV Networks could NOT project the winner, because the computers could not make the projection come true. My take: The computers used in Manchester and other large cities in New Hampshire in 1996 were programmed against the patriotic Senator Smith. But the Votescam syndicate miscalculated, and did not steal enough votes from Senator Smith in the large cities using the election computers. Therefore, the hand-counted votes from the outlying areas of New Hampshire overtook the computerized warping of the vote in the large cities. b) In those states, citizens, candidates, and local press people were illegally prevented from getting at the ballots in any effective way to conduct a count of anytime. In some states, like Ohio, the citizens are prevented from even seeing any of the ballots after they put their own into the ATM-like machine at their polling place. In other states, like South Dakota, the citizens are allowed to watch the votes fed into scanner machines from a few feet away, but that poses no risk, since no one can see what’s going on inside the computers in the scanners. “Why am I always being asked to prove these systems aren’t secure? The burden of proof ought to be on the vendor. You ask about the hardware. ‘Secret.’ The software? ‘Secret.’ What’s the cryptography? ‘Can’t tell you because that’ll compromise the secrecy of the machines.’… Federal testing procedures? ‘Secret’! Results of the tests? ‘Secret’! Basically we are required to have blind faith.” —Dr. David L. Dill, Professor, Computer Science, Stanford University, as cited by Ronnie Dugger in his article, “How They Could Steal the Election This Time,”which appeared in the August 16, 2004 edition of The Nation magazine.